The wait is over, and boy was it worth it. Bay Mazda in Belleville has the car that has been around, and continues to turn heads; especially with the redesign. We are here to tell you that although it has had a facelift, it is still everything that the MX-5 has always been and will continue to be. It combines the driving experience, safety and charisma that have made this car timeless; all while harnessing the intelligent and inspiring Skyactive Technology. We at Bay Mazda are proud of what has inspired this car! When you drive the new MX-5, you experience what we call Jinba Attai....WHAT IS THAT? The connection that you make to your car is important, like a horse and it's rider. When Mazda uses this term "Jinba Attai" it literally means Horse and it's rider... as one. It is an extension of one's body, thoughts and intentions. From the placement of the shifter to the stance you take sitting in its adaptable seat, it feels right. When you up-shift into third gear and power through a corner, it knows what you want and what you need in your strive for the best possible driving experience. B) Taller drivers sit further back and preferably lower in the car. With an inclined seat rail, you will sit higher the closer you are to the wheel naturally. That defeats the purpose of the seat height adjustment altogether! Yet another way that this car is an extension of yourself. The KODO stitching conforms to your body and keeps you planted in the seat comfortably. When you come into Bay Mazda in Belleville, request to see under the hood of this classic. It prides MX-5 fans and overall car enthusiasts with its extremely polish-able finishing. Be proud to pop the hood and show off that shiny SKY-ACTIVE engine! WHY NOT? 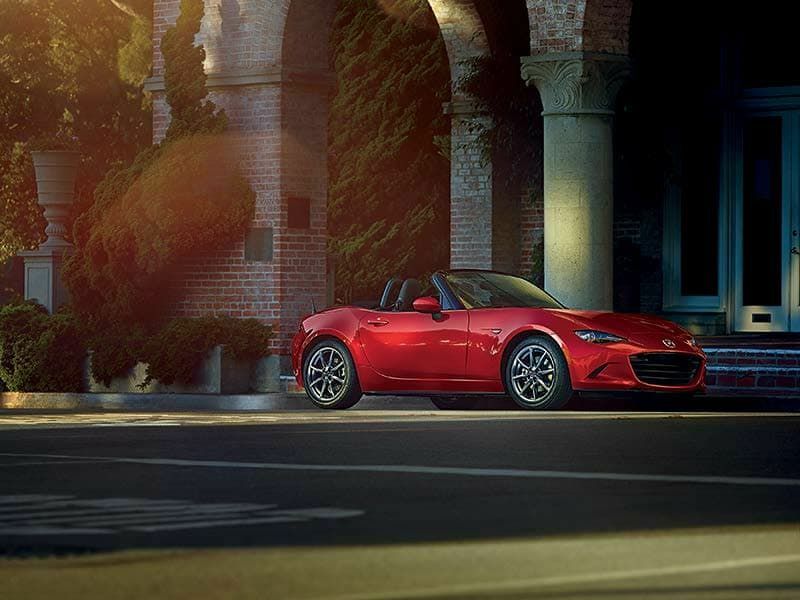 The well balanced structure and seat placement in the MX-5 keeps you in a balanced position, resulting in a comfortable and sporty ride that will always keep you in complete control. This makes it more exhilarating cresting hills and entering corners. TRY YOURS TODAY AT BAY MAZDA BELLEVILLE!